Home Entertainment The biggest talent competition on the continent, The Voice Nigeria is back for Season 2! The biggest talent competition on the continent, The Voice Nigeria is back for Season 2! Another opportunity has presented itself for any Nigerian to showcase his/hertalent! ENUGU (8th& 9th April) Universal Hotel - Plot 3, Aguleri Street, Independence Layout, Enugu Auditions start8am each day. 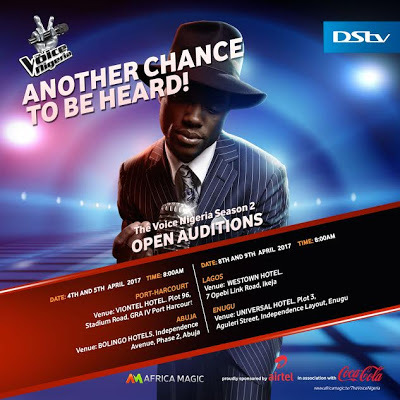 For more information on The Voice Nigeria Auditions, go to the www.africamagic.tv or follow Africa Magic and DStv on social network. The Voice Nigeria, is proudly sponsored by Airtel in association with Coca-Cola.